Do you want to feel better every day? Are you tired of your mood controlling you instead of you controlling your mood? Do you genuinely want the world to be a kinder place to live? Of course. We all do! 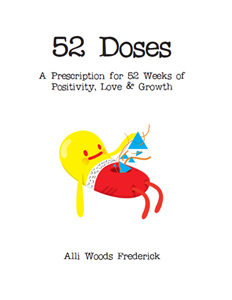 52 Doses is a collection of reflections, quotes and thoughts to help move you to a place of positivity, happiness & love. I created cute and fun little playsheets for you too, because what fun is anythingwithout the...well...FUN? 52 Doses is a book that will help you pop emotional wheelies and make mental donuts in the parking lot…a book that makes the process of discovering your happiness fun & practical…a book that gives you time to process it all. Writing 52 Doses helped me heal & grow and my hope is that it will do the same for you. 52 ideas. 52 chapters of love. 52 opportunities to consider something new. ♥♥♥Remember, it's all about the love, baby!